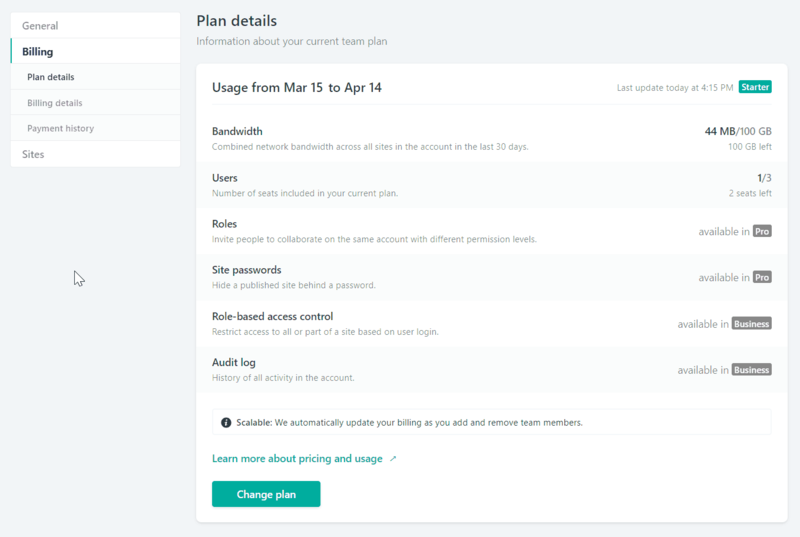 To view billing information or change billing-related settings, select the relevant team from the team dropdown in the top left corner of the Netlify UI, then select Team settings > Billing. Each team has a subscription plan. To view features for the selected plan and and usage for the current billing period, go to Team settings > Billing > Plan details. To upgrade or downgrade your team plan, select the Change plan button to choose your new plan. For site add-ons, you can find a list of all of a site’s enabled add-ons by going to the site’s Settings > General > Site details > Add-ons. Selecting an add-on from the list will direct you to the usage and settings panel for that add-on. Select the Change level button to change the level of the add-on. Metered add-ons are automatically upgraded based on usage. Note that you cannot downgrade an add-on during a billing period where your usage exceeds the limits of the lower add-on level. 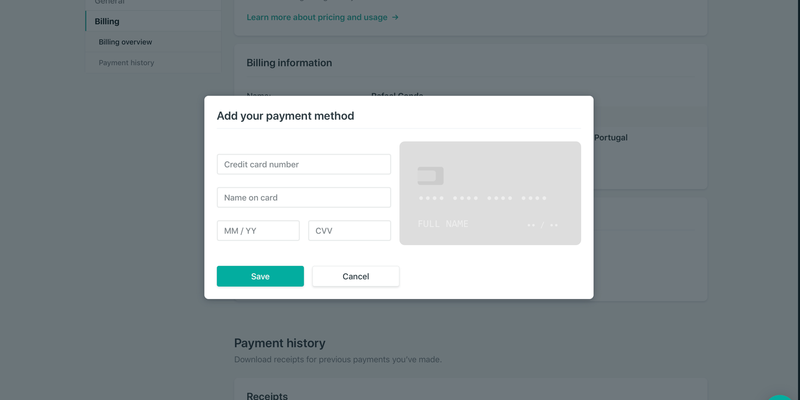 To change the billing information for a team, select the team from the team dropdown in the top left corner of the Netlify UI, then select Team settings > Billing > Billing details. Name – This name appears on billing emails and receipts. Email – All billing communications and receipts are sent to this email address. Details – You may use this field for your own internal recordkeeping. The value of this field appears at the top of all receipts. Payment method – All charges for domains, add-ons, and plan subscriptions assigned to the team are charged to this payment method. Only Owners and Billing Admins can make changes to billing information. For more information about team member permissions, check the Teams documentation. 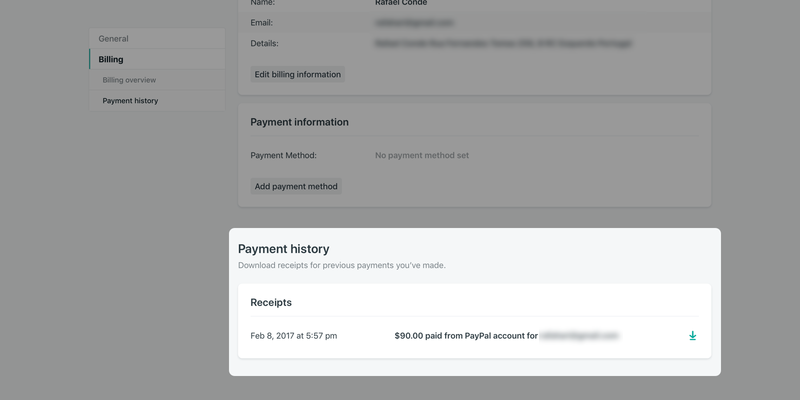 You can find a list of all previous payments under Team settings > Billing > Payment history. Each receipt in the payment history has a link to download the receipt as a PDF. An account becomes overdue if payment is not made at the end of a team’s billing period. This may happen because the team does not have a payment method set up or because the provided credit card has expired. We will send notice, via daily emails and a banner in the web UI, that the team account is overdue. We will retry processing the required payment once per day and also immediately after an update to the team payment method. After two weeks of non-payment, the team account will be restricted. Team members will no longer be able to take administrative actions like adding a new site or changing site settings. API PUT/POST/DELETE requests will fail with “Access denied”. After four weeks of non-payment, the team account and all of its sites will be suspended. The only allowed action will be to update the team payment method. When people try to load a site belonging to the team, they will see a page that says the site has been suspended. We will stop sending daily emails prompting for payment. The web UI will continue to show a banner message. The team account will no longer incur new charges beyond the overdue amount. A team Owner or Billing Admin can restore full service at any time by providing a valid payment method for the team.